Last week saw the publication of Stephen Hendry’s long awaited report into the prospects for tidal energy in the UK, and the hyperbole in the press has been interesting to observe. “I believe that the evidence is clear that tidal lagoons can play a cost effective role in the UK’s energy mix and there is considerable value in a small (less than 500 MW) pathfinder project. I conclude that tidal lagoons would help deliver security of supply; they would assist in delivering our decarbonisation commitments; and they would bring real and substantial opportunities for the UK supply chain. Initially the report was greeted by a string of positive press reports, drawing largely on the report and quoting Tidal Lagoon Power the sponsors of the flagship tidal lagoon project at Swansea Bay. The Daily Mail ran a headline saying that tidal power could provide 30% of the UK’s energy needs. However, as analysts have begun to dig deeper into the report and surrounding data, a less favourable view is emerging. Quick out of the blocks (actually the day before publication of the Hendry report!) was Richard Howard, writing for the Policy Exchange. He points out that the technology is very expensive, and that other technologies are likely to be more cost effective. Although the developers accept that the upfront costs are very high, they consider that this is acceptable since tidal schemes would have significantly longer operating lives than alternative technologies, and so on a life-time basis, the costs become attractive. Howard’s view is that this claim is untested, that the cost estimates for the project have already risen a number of times. He also argues that other arguments in favour of the technology are spurious since jobs and export opportunities would be created from any large infrastructure projects supported by the government. The Financial Times also raises doubts about the costs, pointing out that the Hendry report’s claims in relation to the costs to consumers appear to be somewhat understated (Hendry only includes the direct costs and ignores the fact that costs imposed on industrial users would be passed on to consumers indirectly). 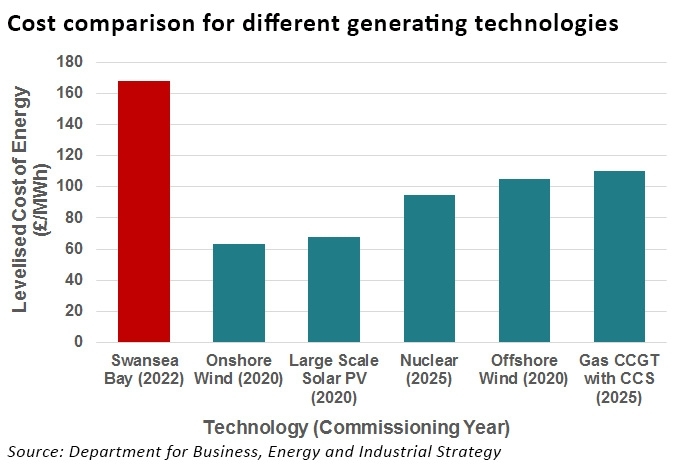 The paper also points out that the amount of power the Swansea Bay project will generate is extremely small at just 0.2% of the UK’s annual consumption. This issue is also raised in the Telegraph, where Christopher Booker compared the £1.3 billion price tag for the 48 MW Swansea tidal project with the 2000 MW Pembroke CCGT which was completed in 2012 at a cost of less than £1 billion without any subsidy (although it should be noted that the nameplate capacity of Swansea Bay is 320 MW). Are the lifespan claims realistic? Tidal Lagoon Power claims its technology has a lifespan of 120 years. I have not been able to find any independent evidence to support this claim, and common sense would suggest that turbines with a 3-hour on, 3-hour off bi-directional operating regime in a highly corrosive environment may suffer from mechanical degredation and require major maintenance if not replacement during the project life. Operating costs will also depend on the degree to which de-silting is required, and how frequently circuit breakers, transformers, cabling and other parts of the infrastructure need replacing. The lagoon’s sea-wall will also need to be maintained during and after the operating life of the power station. Euan Mearns in Energy Matters has published a detailed analysis challenging the claims that tidal power could deliver baseload power. 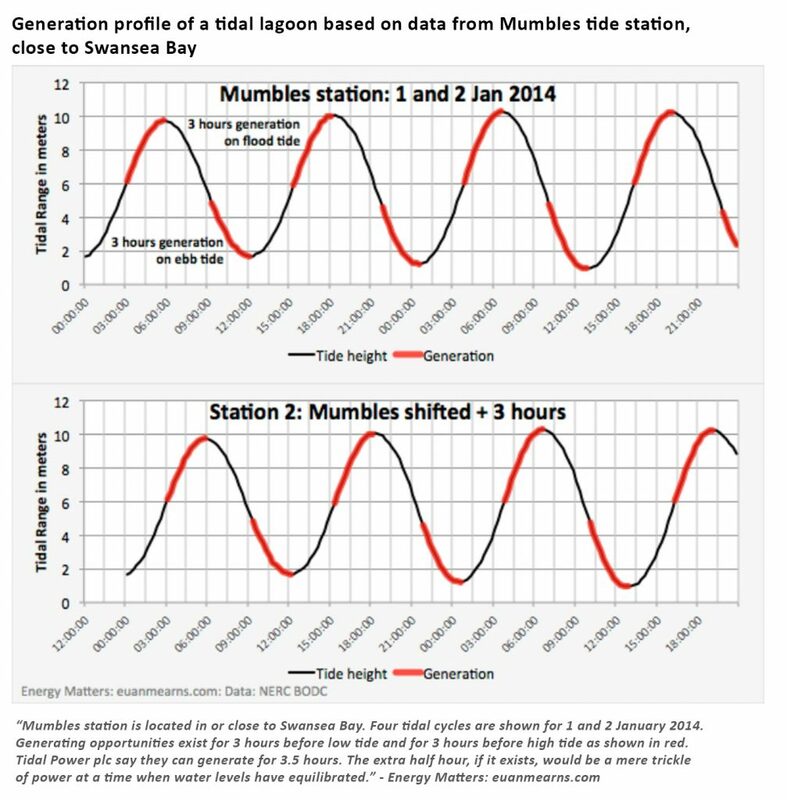 Each tide has two generating opportunities – the 3 hours before high tide and 3 hours before low tide, with periods of zero generation in between. Proponents of the scheme suggest that having multiple tidal lagoons at different points round the coast would allow for nearly continuous generation as the high and low tides at each location would occur at different times, however Mears has examined tidal data for the proposed tidal stations around the UK and found that there are two groups whose tides are almost exactly 6 hours out of phase. This means the intermittency is amplified by the portfolio and not reduced, as they are generating at the same time. Mearns also addresses the cost issue, comparing the £21.7 million per derated MW installed cost of Swansea Bay with the £6.6 million per installed derated MW for Hinkley Point. Back in 2015, the charity Citizen’s Advice branded tidal power “appalling value for money” saying it would be per unit of output, the most expensive significant renewable energy project in Britain. The analysis that has emerged over the past week supports this assertion….tidal projects look very expensive when compared with alternative projects and risk increasing the cost if intermittency on the system. The project economics are subject to uncertainty – risks relate to the capital costs, operating costs, lifespan and impact on the power grid. While these are not in principle reasons for rejecting the project, when put into context of scale, it’s difficult to justify the expense for the amount of power the scheme could potentially generate. The government has an objective to deliver a reliable, low carbon energy system at the lowest reasonable cost – it seems doubtful that current tidal lagoon technology could meet that goal. Good article, Kathryn. Nice to see you reference Euan Mearns’ analysis too. I’ve yet to see any informed commentary in favour of this scheme, and I say that as someone who is, on the whole, very much in favour of renewable energy. It’s hard to see where economies of scale can be achieved in this technology. The large part of the work is civil engineering (massive sea-walls) where projects, by and large, have a tendency to over-run on both time and budget. Technologically it’s pretty simplistic so I doubt there’s much room for cost improvements there. That is to say that, as a solution, tidal amplitude power schemes like this will start expensive and stay expensive…. there are better alternatives. Thanks Nigel. I was starting to worry when I started this piece last week and Richard Howard looked like the only person speaking against the project. Thankfully over the weekend more people have started looking at the detail and finding issues (including the excellent Euan Mearns). I actually think it’s a shame because tidal power feels like something that should work. I overlook the Thames and the sheer volume of water that flows in and out twice a day is staggering – it feels as if there should be a viable technology for exploiting this. The lagoon concept seems appealing and it’s easy to see wider benefits for local tourism, industry etc BUT the cost is just far too high. I’ve often though that the Thames Barrier could function efficiently as a part of a tidal flow scheme. Keep some of the gates shut, thereby forcing the water through the others that remain open and install tidal flow turbines in those.. only problem being when you need to shut all of them…. On a similar theme, the Cardiff Bay Barrage could be used for tidal amplitude generation, simply by retrofitting turbines of the type to be use in Swansea Bay into the barrage. There are a number of other places where one or the other type of tidal generation could be used around the UK, but none of the potential scale that is proposed by the lagoon concept. In terms of the lagoon concept, I think they need to trial something much smaller and cheaper (in outright terms) than Swansea Bay. This would prove more expensive in £/MWh but would allow for some real world evidence of the problems that would arise (siltation is one of many). If these prove manageable then go for something really big like Colwyn Bay. Swansea Bay is too big for a trial and not big enough as a solution…. has a number of problems…most include the word – SILT. Since Cardiff Bay Barrage was built (1999), parts of Grangetown & Riverside particularly the area bounded by Clive st, Corporation Rd & Ferry Rd (there’s a clue in the name) have been suffering increased damp & some subsidence as the silt gradually re-absorbs water from the now permanently high water table. In my days in Cardiff, the bay was constantly dredged of foul glutinous stinking silt/mud to keep the port open. You can also see the silt build up at the mouth of the river Taff next to The Marl. They periodically open the sluices to flush a small % out into the Severn. 3. 12 All built on silt. 13. 16. 43. 46 was salt marsh. 51. 52. 60 the river of mud.